PHOTO BY RYAN WILLIAMSON UR researchers Douglas Kelley (left) and Jeff Tithof: following some promising leads in their study of a rapidly growing disease. PROVIDED BY UNIVERSITY OF ROCHESTER Particles are tracked (left) showing cerebrospinal fluid flowing through spaces in the brain adjacent to an artery. Fluid indicated in green arrows (right) shows that the fluid is moving in the same direction as blood flow. In someone with high blood pressure, the fluid moves more slowly and isn’t removing waste from the brain as efficiently. Last year, more than five million people in the US were living with Alzheimer's Disease, the most common form of dementia, and that number is expected to grow to 14 million by 2050. Alzheimer's is the sixth leading cause of adult deaths in the US, more than breast and prostate cancer combined. And the cost of medical treatment reached a staggering $217 billion in 2018, a figure that's growing so rapidly, according to the Alzheimer's Association, that it's straining the nation's health care system. There's no cure for Alzheimer's Disease, but researchers at the University of Rochester are following some promising leads. They've been exploring the link between hypertension – high blood pressure – and Alzheimer's. It's well established that people who have high blood pressure, particularly when they are young, are more likely to develop Alzheimer's later in life. One in four Americans has high blood pressure and, if it's not controlled through medication, it can lead to a heart attack or stroke, making high blood pressure and Alzheimer's a particularly nasty combination. Exactly what role high blood pressure may be playing in the development of Alzheimer's Disease is still unknown, though. Alzheimer's is characterized by an onset of related symptoms, the most common being various forms of memory loss, such as forgetting something that was just discussed, not remembering routine tasks, and struggling with decision-making. Researchers are pretty sure that these problems have something to do with the formation and buildup of what they refer to as "plaque" and "bundles of fibers" in the brain that are produced by a pair of proteins. As the plaque builds over time, the normal interaction between the nerve cells becomes increasingly interrupted. "Autopsies have shown that these sticky plaque buildups in the brain block neuron activity," says Jeffrey Tithof, a postdoctoral associate at the UR. 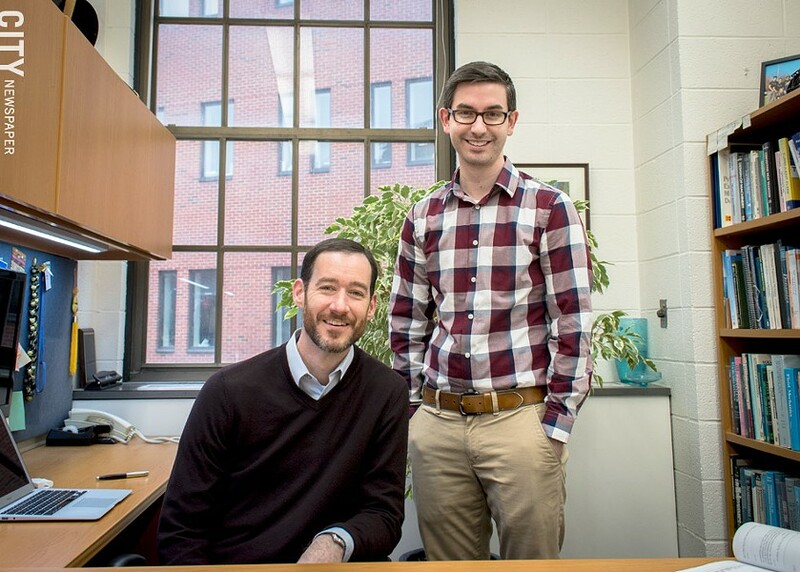 Tithof and Douglas Kelley, an assistant professor of mechanical engineering at the UR, built their study on earlier research by Maiken Nedergaard, co-director of the UR's Center for Translational Neuromedicine. Nedergaard examined the glymphatic system, a system in the brain that functions in some ways similar to the lymphatic or immune system in rest of the body. She studied how the glymphatic system acts as a pathway where cerebrospinal fluid flows outside and around blood vessels in the brain and protects it by removing waste material. Kelley, whose expertise is in the science of fluid dynamics, says one way to imagine this pathway is to think of a pipe containing fluid that encases another smaller pipe containing fluid – the smaller one being blood vessels. Nedergaard's team learned how the cerebrospinal fluid pumps through this canal system into brain tissue and flushes away the waste. Kelley and Tithof took another look at the glymphatic system. In their study, reported in the November 2018 issue of the research journal Nature Communications, the two examined the "pulsations" that pump the cerebrospinal fluid. They wanted to know what happens when there are changes in the pulsations, and whether these changes occur in people with high blood pressure. "It's really an engineering question," says Kelley. Humberto Mestre, a UR doctoral student, worked with Kelley to microscopically film the brain activity of mice. Minute particles were injected into a mouse's cerebrospinal fluid, and the film tracked the individual particles in real time. "We traced how the particles moved, measuring flow speed and how the particles moved in relation to the heartbeat," Kelley says. They could see that the pulsing of the cerebrospinal fluid moved in a highly synchronized way with the mouse's heartbeat, Kelley says. "The blood vessels should be responding to the heartbeat, but this fluid is outside of the vessels," he says. "Our hypothesis is that as the heart beats, the pulses on the sidewall of the blood vessels is pushing this fluid along, too." And it's moving in the same direction as the blood, something that's been debated, he says. The blood vessels are normally like strong flexible tubing, but the vessels of a person with high blood pressure become stiffer and less flexible, Kelley says. This not only means that it is harder for the heart to pump oxygen to the brain, but it also means that a change in the pulsation slows the flow of cerebrospinal fluid, and that would change the wave pattern of the fluid. They confirmed this in mice with high blood pressure. "A slower flow would slow the waste removal," Kelley says. It's possible that a person with high blood pressure is experiencing a reduction in the pumping of the cerebrospinal fluid. And allowing the waste to build could be contributing to the plaque buildup and onset of Alzheimer's Disease, Kelley says. The findings point to other issues Kelly's team is looking into. For instance, in a traumatic brain injury, how does the glymphatic system respond and where does the cerebrospinal fluid go? And there is the challenge of getting medication past the blood-brain barrier, a highly selective semipermeable seal that protects the brain from foreign invaders and pathogens. Could the glymphatic system's fluid be used to better deliver medication to specific areas of the brain? The study, which was made possible through a $3.2 million grant from the National Institute on Aging, gave him a whole new appreciation of bioscience and the complexity of neurology, Tithof says.